RAXYL is a systemic fungicide with a protective and curative action, absorbed through the leaves, stems and roots. 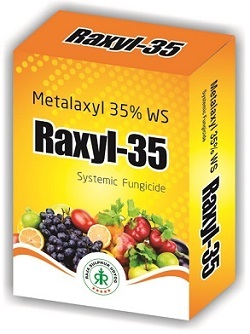 RAXYL (METALAXYL 35% WS) is a systemic fungicide with a protective and curative action, absorbed through the leaves, stems and roots to control diseases caused by air and soil borne fungus i.e Scab, Anthracnose, Anthracnose, Downy mildew,Early blight, and Late blight diseases of various crops like Maize, Bajra, Sorghum, Sunflower, Mustard, Sugarcane, Potatoes, Tomatoes, Vines, Peppers, tobacco etc in accordance with the climatic conditions and local authorites. It is also highly used as wet slurry Seed Dresser. 600 to 700gms with a dilution of 0.75 to 1ltr / 100 kg Seeds or as being recommended.